Ecoquel Micromix - Kenya Biologics Ltd.
COQUEL MICROMIX is a balanced mix of micronutrients fully chelated by EDTA. It also contains 2% of free amino acids that increase the uptake of nutrients by the plant. ECOQUEL MICROMIX can be applied by foliar spraying or through irrigation systems. Apply in cases of recognized need. For foliar application do not exceed the maximum recommended dose and avoid times of high solar radiation. ECOQUEL MICROMIX is stable for 3 years from date of manufacture. Keep in a cool ventilated area. Do not store for prolonged periods in places with direct sunlight. Keep out of reach of children. Stay away from food, drink and animal feed. ECOQUEL MICROMIX is compatible with most pesticides and fertilizers used on crops where it is recommended. Whenever possible, it has to perform a compatibility test in a small volume. It is suitable for organic farming, with CAAE certificate. 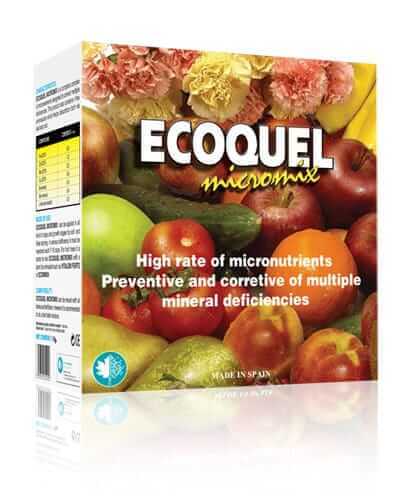 ECOQUEL MICROMIX is compatible with most pesticides and fertilizers used on crops where it is recommended. Whenever possible, it has to perform a compatibility test in a small volume. Suitable for organic farming, with CAAE certificate.